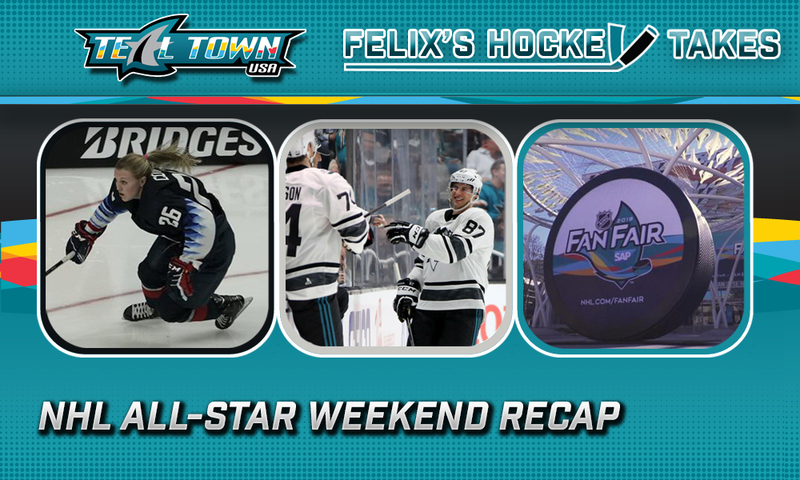 I am going to recap the fun NHL All-Star Weekend in San Jose, California, from the NHL All-Star Media Day, to the NHL Skills Competition, the All Star Game, and then finally ending with the Fan Fair. 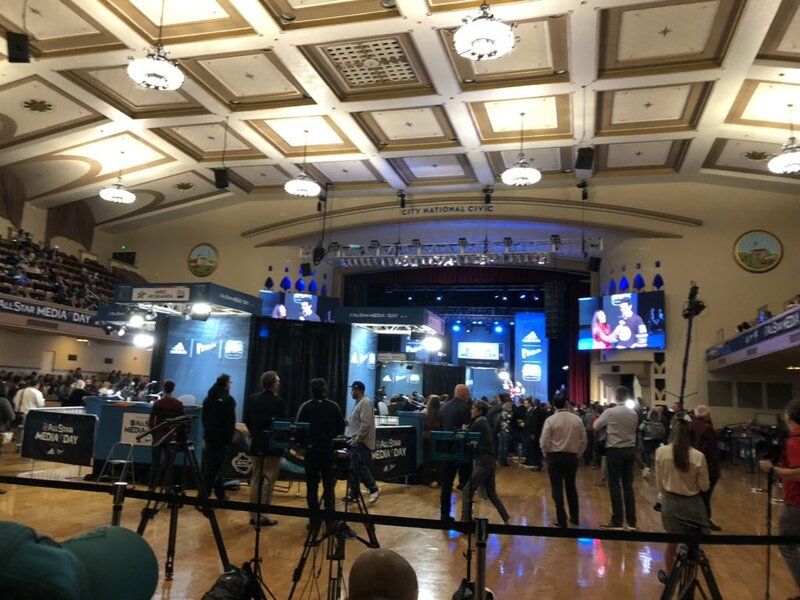 City National Civic in San Jose, CA, where the 2019 NHL Media Day was held. Photo courtesy of Teal Town USA’s Erik Kuhre. For fans who had tickets for all four days (or just Thursday) of the Fan Fair, they most likely got a chance to check out Media Day where the NHL All-Stars were interviewed at City National Civic which is just across the street from where the NHL Fan Fair is held at the San Jose McEnery Convention Center. It’s also at City National Civic where the boo birds started raining down on players like Toronto’s John Tavares, the LA Kings’ Drew Doughty, and Anaheim’s John Gibson (it was a common theme throughout the All Star Weekend). 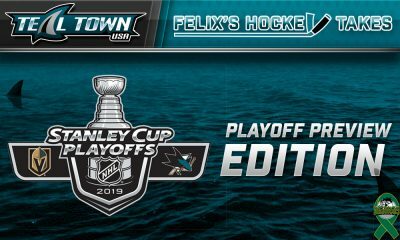 As expected, of course, three representatives of the San Jose Sharks drew the most cheers from the home crowd as Joe Pavelski’s, Brent Burns’, and Erik Karlsson’s names were announced by the host, Jon Root. 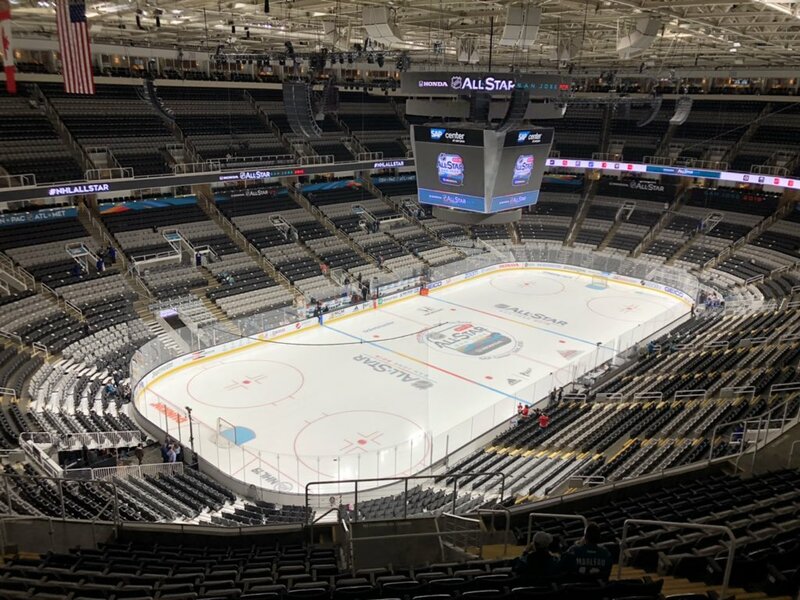 The SAP Center (commonly known as “the Shark Tank” or just “the Tank”) in San Jose, CA, where both the 2019 NHL All-Star Skills Competition and the 2019 NHL All-Star Game were held. Photo courtesy of Teal Town USA’s Erik Kuhre. Friday was the All Star Skills Competition. Of course, Tavares, Doughty, and Gibson were booed; the hometown boys of Pavs, Burnzie, and Karlsson were cheered. It was also the first ever introduction of the women in hockey at the NHL All;Star events, who rarely ever get their share of respect in the game. Representing the United States Women’s National Team were Brianna Decker and Kendall Coyne Schofield. For the Canadian side, it was Rebecca Johnston and Renata Fast. An important note before I get into the events at the Skills Competition is that Schofield was the lone female participant in the Fastest Skater replacing the injured Nathan MacKinnon of the Colorado Avalanche, whereas Decker, Johnston, and Fast as well as select NHL mascots, demonstrated how the other events worked. This one is pretty self explanatory. There are eight total skaters competing. Each skaters are timed for a full lap around the rink. Skaters can choose which direction to skate for their lap. The repeat winner of this event for this year was Connor McDavid of the Edmonton Oilers(surprise, surprise) at 13.378 seconds. Jack Eichel of the Buffalo Sabres recorded the second best time of 13.582 seconds, with Mathew Barzal of the New York Islanders recording the third best of 13.780 seconds. Schofield came in seventh at 14.346 seconds. In this timed event, again there are eight skaters competing. There are three skills. The first skill is stickhandling, where “a skater controls a puck through a series of ten pucks in a straight”, per the NHL website. The second skill is cone control, where a skater has to control the puck through a series of eight cones in a zig-zag formation. The third and final skill is called “Gates”, where a skater has to go through each gate, shooting pucks and guiding the puck through a lit rung of the gate. The winner of this one was Johnny Gaudreau of the Calgary Flames, finishing with a time of 27.045. Chicago’s Patrick Kane came in second at 28.611 seconds, and Philadelphia’s Claude Giroux came in third at 30.270 seconds. In this one, a minimum of four goalies are involved as well as all 36 skaters. This event is basically a shootout to see not only which players get which goalies to bite on a fake or a deke, but also which goalies can last the longest. Pekka Rinne of the Nashville Predators had a longest save streak of 2 against Pacific Division shooters. Andrei Vasilevskiy of the Tampa Bay Lightning came out with an 8-save streak. 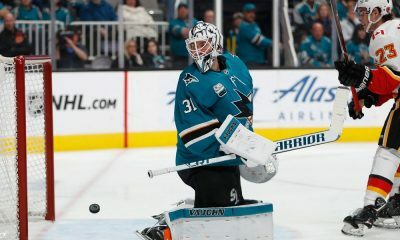 Goalie John Gibson of the Anaheim Ducks finished with a streak of 3 saves against the Central Division. Braden Holtby of the Capitals finished a longest save streak of 2. Devan Dubnyk of the Minnesota had 7 saves for his longest streak against the Pacific. Jimmy Howard, representing Detroit, had 2 for his longest save streak going against the Metro Division. Last year’s champion, Marc-Andre Fleury of the Vegas Golden Knights, did not get to repeat. His longest save streak was 6 against the Central Division shooters. This year’s champion goes to the New York Rangers’ Henrik Lundqvist, who was absolutely feeling it. He recorded a longest save streak of 12 against the Atlantic Division. Eight players compete in this one, which like the Puck Control event consists of three skills over one round. The first is the breakout pass, during which each player has 10 pucks to attempt to make a pass to three “players”. The puck has to be tape to tape or it doesn’t count (almost like a regular hockey game, where you’d prefer the pass to be tape to tape and not off a skate). The second skill involves mini nets, where players have to sauce pucks into the nets (which btw is the most insane skill and event ever). The final event is target passing, where each player has to complete a successful pass to each target that random lights up every three seconds. The winner of this event was Edmonton’s Leon Draisaitl*, who finished with a time of 1:09.088. The second best was Sebastian Aho of the Carolina Hurricanes, who finished with 1:18.530. Ryan O’Reilly of Colorado came in third with 1:25.897. The Sharks’ Erik Karlsson had the seventh best time of 1:58.824. *If you want to read about the controversy of the results of the Premier Passer event, check out Jennifer Moglia‘s article on Puck It Up! Four players compete in this one with two attempts to see who’s got the hardest slapshot, which is measured in miles per hour. The winner of this event was John Carlson of the Washington Capitals, who registered 102.8 mph on his first attempt and 100.8 on his second. San Jose’s own Brent Burns missed on his first shot, but recorded 100.6 mph on his second attempt. In this particular timed event, eight players will have five targets on net to shoot on. It is also based on random LED light up, so each player has three seconds to hit a target before another target lights up at random. The winner of this one was Boston’s David Pastrnak, who finished in 11.309 seconds. Kris Letang of the Pittsburgh Penguins finished second with 12.683 seconds. Drew Doughty of the Kings had the third best time of 13.591 seconds. Joe Pavelski of the Sharks finished at 14.423 seconds. Unfortunately, the Pacific Division did not come out victorious in this one, getting blown out early 10-2 against the Central Division. There were plenty of boos to John Gibson, who performed pretty poorly in net, perhaps as to not risk injury in a rather meaningless game. Though the “We want Fleury!” chants came from the crowd, Marc-Andre Fleury didn’t fare any better. The Metropolitan Division put up a better fight against the Atlantic Division in what was, at first, a rather close and low scoring affair until later on. The Metro beat the Atlantic 7-4. In the championship game between the Metro Division and Central for the million dollar check and new car, it was the Pittsburgh Penguins’ Sidney Crosby and the rest of the Metro who were victorious this year, defeating the Central 10-5. Crosby, Letang, and Barzal put on an absolute clinic out on the ice (hey, got to give credit where credit’s due). Crosby, of course, wins the All Star MVP. The NHL Fan Fair lasted throughout the weekend, starting on Thursday. Personally, I couldn’t go until Saturday, for which I actually had a ticket for. Let me tell you. This is an event I’ll never forget. They had tons of stuff to do and people to meet, and there were a lot of photo opportunities. 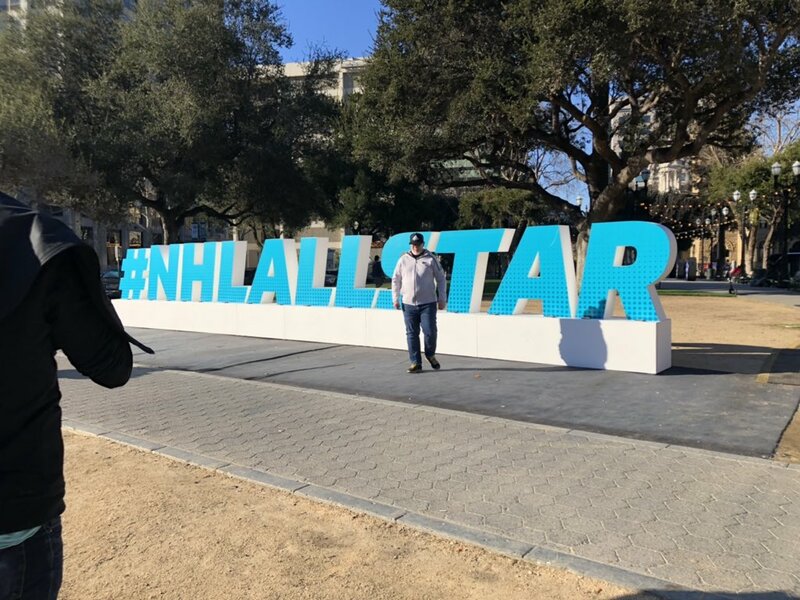 The NHL All-Star sign, located at Plaza de Cesar Chavez (otherwise known as Cesar Chavez Park) in San Jose, CA. Photo courtesy of Teal Town USA’s Erik Kuhre. The most memorable part of fan fest, other than finally getting to meet the San Jose Sharks play-by-play broadcaster, and one-and-only, Randy Hahn, as well as Sharks color analyst Jamie Baker, was standing right behind the Stanley Cup for a picture. It was once-in-a-lifetime opportunity for me, as well as I’m sure many others who don’t get to travel to Toronto a lot for the Hockey Hall of Fame. Right in front of the Cup were the other trophies in the Hall of Fame section that are handed out annually at the NHL Awards in Las Vegas. 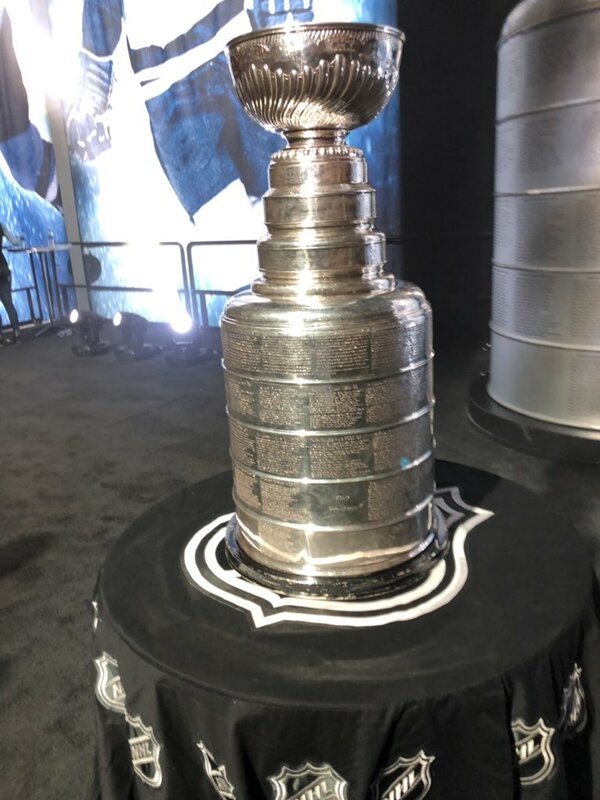 The Stanley Cup, at the 2019 NHL Fan Fair held at the San Jose McEnery Convention Center in San Jose, CA. Photo courtesy of Teal Town USA’s Erik Kuhre. Events included Accuracy Shooting, a little rink for ball hockey, the Hardest Slapshot, etc. Sadly, I never got to participate in any of them because I was too busy waiting in lines and taking pictures (all worth it though)! Still talking the events of Saturday, Randy Hahn was on stage from 11 AM to 1 PM talking with Florida Panthers defenseman Keith Yandle and then Dallas Stars defenseman Miro Heiskanen respectively. Then from maybe 2 PM to 4 PM, Jamie Baker took over the interviewer’s seat to talk and reminisce with Sharks Alumni forward Owen Nolan before hosting the four U.S. and Canadian women. While I never got the chance to get the womens’ autographs as the line was cut short so that they could be interviewed by Bakes, I got the chance to get Sharks Alumni forward Devin Setoguchi’s autograph who made his appearance at the Autograph Theater. Speaking of Sharks Alumni forwards, Bakes was kind enough to autograph my new mini Sharks Territory sign. Overall, it was such an amazing time. I know Burnzie was at the Fan Fair as well on Thursday after the NHL Network Media Day coverage. This was a dream come true. I don’t care who you are. I don’t care what team you cheer for. In the famous words of Tomas Hertl, “This is dream”. It really is. I saw a lot of coverage of the Fan Fair on local news and their websites, more coverage than you’ll ever get on a Sharks’ game day, that’s for sure. But this was just such a great way to grow the game here in the Bay Area, even though I know the Sharks are already huge here. We have such a passionate fan base. We’ve gone through the highs and lows of Sharks hockey. 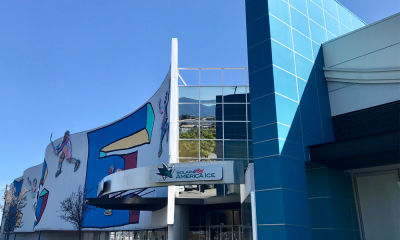 Of course, Sharks Ice is ever so popular now, with the facility in San Jose the biggest one west of the Mississippi River. But I think, if anything, this should show to the NHL and NHL fans around the league that San Jose is a hockey city. This is a city that’s now hosted the NHL All-Star Weekend twice (this year being my first), the Stanley Cup Final in 2016, and the Stadium Series back in 2015. 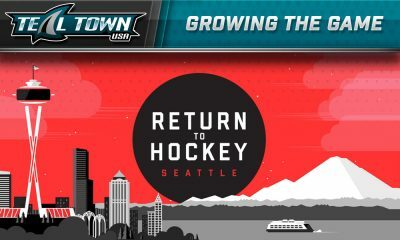 That’s huge, in my opinion, and I can only hope the NHL gives the Sharks the OK on another event like this, even if it’s another outdoor event. Look at Dallas. During the All Star Weekend, NHL commissioner Gary Bettman announced that the Stars were going to be hosting the Nashville Predators for the 2020 Winter Classic at the Cotton Bowl. Outdoor games work for places like these, guys! With the success of the Sharks-Kings Stadium Series game in 2015 despite the loss, I don’t see why the Sharks won’t get the nod to host or be a part of another one, either a Stadium Series game or a Winter Classic even if it does take 5-7 years. I really hope a lot of people enjoyed the All Star Weekend and the Fan Fair! I noticed there are a select few who didn’t and, well, that’s unfortunate. But it really was such an amazing event for me and Erik Kuhre and AJ Strong. I’m sure Rocket Backhander had a lot of fun too.